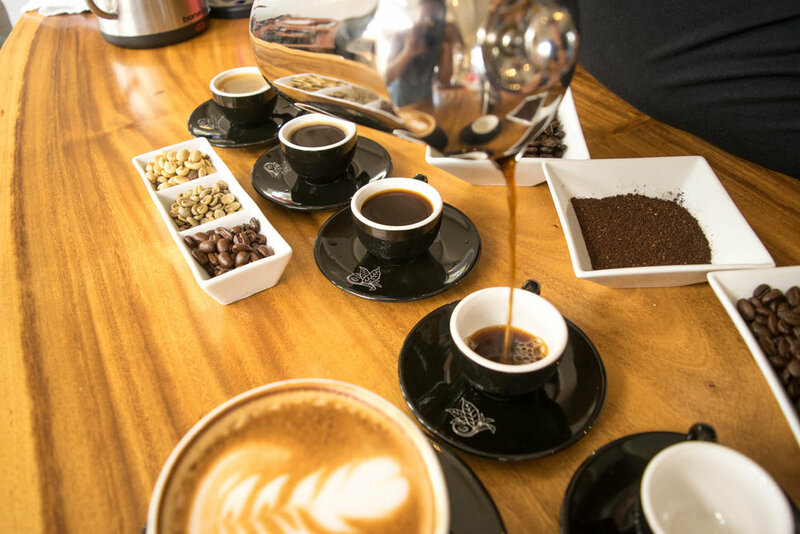 The 100% Kona coffee we serve is grown on our farm, milled and roasted at our mill, and brewed in our café (all within a 10 mile radius). We also seek out the best Hawaiian teas. While not all grown in Kona, they are grown and crafted by people who believe in quality as much as we do. Our single-origin coffee and teas are also available in our online shop. Draft and bottles available from local breweries Ola Brew Co. and Kona Brewing Co.
Additional menu options are available in our café. We can make (almost) any drink you can think up. Don’t see what you’re looking for? Give us a call at 1-888-877-2035. Listed prices do not include tax and may vary depending on chosen size and options. We sell bags of whole bean coffee, tea, macadamia nuts, chocolate covered peaberry, signature granola, 100% Kona apparel, and more at our café and online. Have our staff serve coffee, tea, and food at your business or event. Perfect for corporate events or weddings. You design the menu to fit your venue and we show up with our cart to handle the rest. Get a pump pot of fresh coffee to-go for your next meeting or event. Choose roast and brew options to fit your taste. Café pickup or delivery are available. See pricing below. Deposit also required. Please book at least 48 hours before desired pickup. Mahalo! We will contact you with more information about your request. Our 100% Kona-made gifts are perfect for wedding favors, corporate gifts, and welcome baskets. We offer discounted pricing for bulk orders. We also partner with wholesalers, such as chefs and other artisans who use our coffee in their products or sell them in their restaurants. Please complete the form below to inquire about bulk orders or wholesaling. Mahalo for your interest in bulk orders or wholesaling. A member of our team will contact you shortly with more details. Let our café host and promote your public event. In the heart of Kailua-Kona, our café offers a convenient and comfortable event venue. We provide custom coffee bars for private events in Kona and also book sections of the cafes for birthday parties, showers, and other events. Mahalo! We will check our schedule and get back to you with more information. Have your harvested cherry hulled, polished, cleaned, and graded by our mill. We'll transform your picked cherry into green coffee, ready to be roasted. Our Master Roaster will transform your green beans to the roast of your taste: light, medium, full city, or dark. After roasting, your coffee is ready to be ground and brewed. Mahalo for you interest in our coffee milling and roasting services. We will contact you shortly.